Despite a shiny new graduate degree, a dream job, and a great relationship, something felt terribly off in Kristin’s life. With the weight of uncertainty riding high, she stumbled upon some reading materials that would inspire a complete upheaval of her current life path. To the shock of family and friends, Kristin quit her job, ditched almost all of her belongings, crowdsourced funds, moved into an old van named Gerty, and set out on the road in an effort to eat at and write about every single vegan restaurant in the United States. 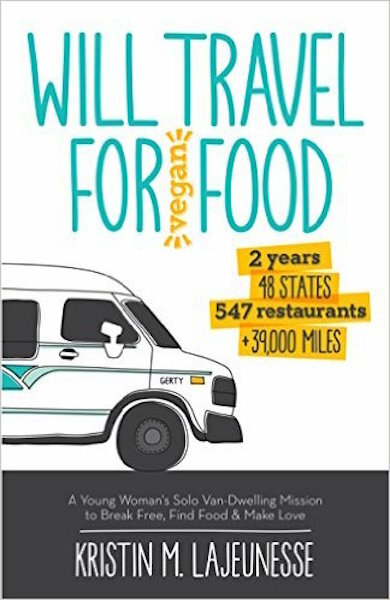 Join Kristin for the ultimate foodie-inspired road trip that spanned 2 years, 48 states, 547 restaurants, and more than 39,000 miles; and find out how it led to her unparalleled freedom, love, and amazing self-discovery.